For music and sound producers on the go, the iPad brings a new era of possibilities and a robust selection of applications to record and manipulate sounds anywhere you might desire. But the limitations of the iPad’s 1/8-inch audio connection and not-quite-professional-quality sound output can be frustrating to producers who are used to working with higher-definition sound. Here we investigate four audio interface options that can help take your iPad music sessions to the next level of sound quality. 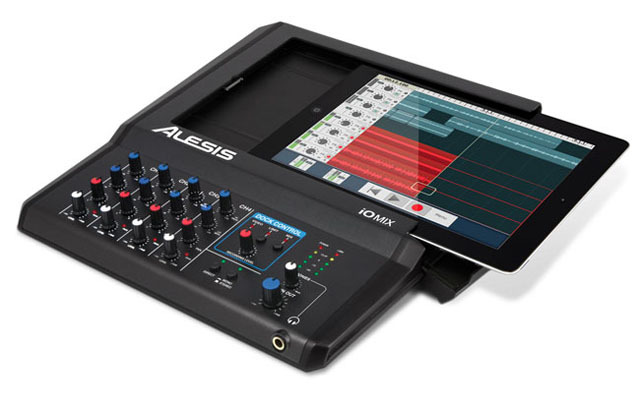 The Alesis iO Mix is a clever combination of audio interface, 4-channel analog mixer, and iPad dock that together create a robust option for audio recording, playback and creation. While we haven’t actually used the iO Mix yet, the device looks to be an intelligent update to Alesis’ iO Dock, taking the best parts of that design and adding some front-panel controls such as trim, channel gain, pan, and low / high EQ controls, as well as some upgrades such as four combo XLR-1/4 inch input channels, phantom power, balanced stereo 1/4-inch outputs and a 1/4-inch headphone output. One of the best features of the iO Mix is the lack of cables that you normally have to plug into your iPad: the iPad itself slides inside the device, which encloses and protects it, and the combination becomes an all-in-one mixer and recording device with a familiar interface. The Alesis iO Mix has a retail price of $299 and is expected to be released in the coming months. If you don’t need four channels, the Alesis iO Dock is currently available with two channel recording for $199. Focusrite, a British company known for affordable high-performance audio interfaces for computers, has introduced its first iOS device with the iTrack Solo — a two-channel audio interface created for the iPad. 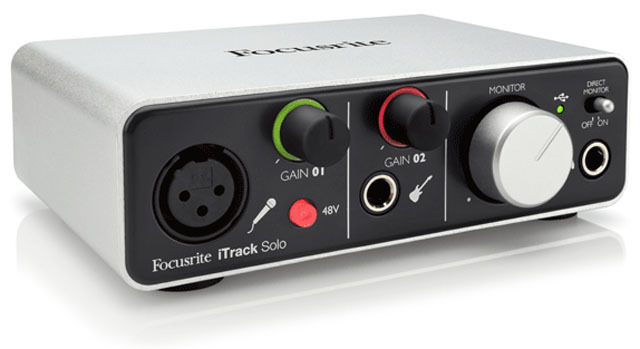 For audio connections, the iTrack Solo offers one XLR and one 1/4-inch input, unbalanced RCA stereo outputs, and a 1/4-inch headphone output all running at 24-bit / 96kHz. For microphones you’ll find phantom power available as well as the same mic preamps that are used in Focusrite’s flagship devices. For digital connectivity there is a USB 2.0 port as well as an iOS device port on the back that allows the iTrack Solo to play nicely with computers as well as iPads. With the addition of a direct monitor switch, this device looks like a solid audio interface for professional recording on the go. The iTrack Solo should cost approximately $160 when it hits stores next month. 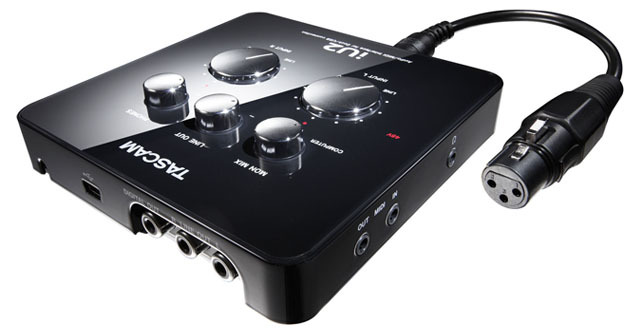 Tascam’s iU2 is an affordable two-channel audio interface designed for the iPad that offers XLR and line inputs, low noise A/D converters, direct monitoring, and 1/4-inch audio outputs. It works with a Mac or PC as well as iOS devices. And while it seems like a bit of the same on the surface, the iU2 shines with some nice extras such as MIDI input/output (which works with iOS devices as well as your computer), S/PDIF digital output, and the ability to switch between your computer or iPad as the host device. It also comes packaged with a USB cable, an iOS dock connection cable, and XLR-to-¼-inch conversion cables. The iU2 is currently available for $149. While the Apogee One is not an officially supported iOS device, according to this link from the Apogee Knowledgebase it does in fact work with the iPad if you connect it to Apple’s iPad Camera Connection Kit and a powered USB hub. Because of this we find the One to be an essential pick for iPad audio interfaces. While you may have to fiddle with some extra connections and cords, you’ll get some of the best sound quality possible from your iOS device in return for the trouble. This small USB interface delivers stereo sound that is on par with Apogee’s higher-end units and uses the same DAC/ADC software architecture. The One offers one quarter-inch (mono) line input, one XLR (mono) mic input, and a multi-function knob on top to control volume and recording levels. If that’s not enough bang for your buck, the One also offers a built-in condenser microphone that incorporates Apogee’s Tuned Aperture Microphone technology, “fine-tuned by professional recording engineers.” From personal experience we can assure you that the microphone, preamps, and output on this device all sound amazing. 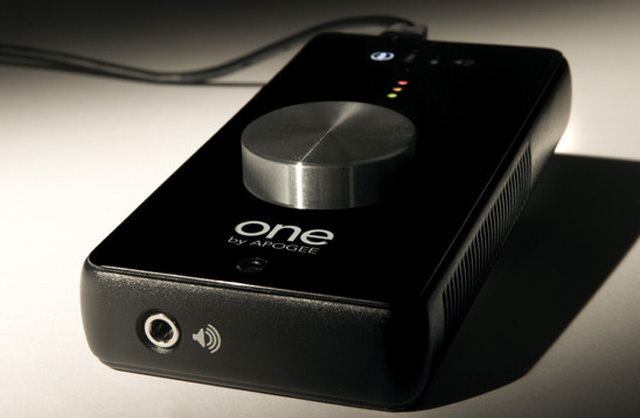 The Apogee One is currently available for $249.